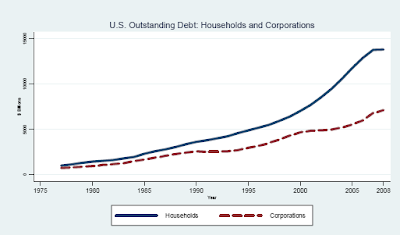 An excellent paper recently came out of University of Chicago by Mian and Sufi called House Prices, Home Equity-Based Borrowing, and the U.S. Household Leverage Crisis. 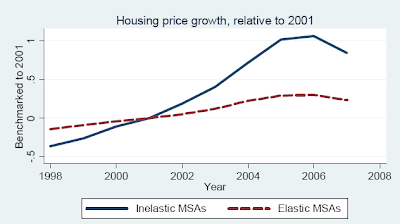 The way Mian and Sufi got around this is by separating the population into two categories: those who live in areas where housing supply was very limited (inelastic) and areas where new construction could add to the supply (elastic). The inelastic areas saw rapid house price increases that were not related to equity prices, job growth, optimism, etc. 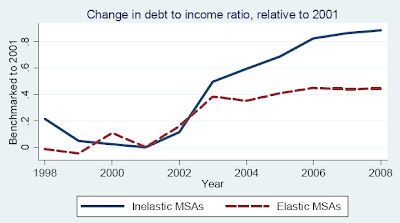 What Mian and Sufi show is that it was the inelastic areas that saw the most borrowing - that is higher house prices were directly responsible for increased borrowing. 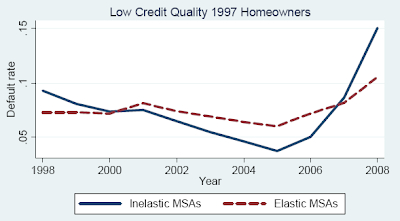 Furthermore it was the poor credit consumers in inelastic areas who leveraged the most. driven mostly by the low credit quality borrower. Mian and Sufi proceed to show that home equity based borrowing was used mainly for consumption and added 2.3% to GDP every year between 2002 and 2006. 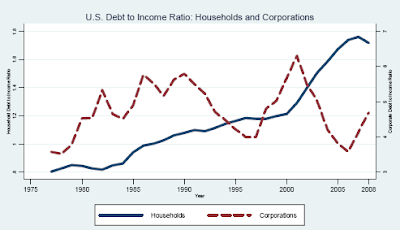 This has enormous implications on any recovery from this recession. All other factors aside, over 2% of US GDP has been near permanently taken out, making it highly unlikely that we revert to pre-recession growth levels any time soon.